Manufacturer & Exporter of Aluminum Terminals. Our product range also comprises of Cable Glands, Cable Lugs and Cable Terminal Ends. Our clients can avail from us a premium quality range of Aluminum Terminals to our customers. 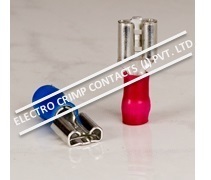 We provide these snaps on terminals in different shapes for effective grip to wires. Our products are made out of high-grade raw material and are cost-effective, durable and corrosion resistant. Looking for Aluminum Terminals ?